Well it took us a while but we finally had people over to our new apartment for some hospitality. We have been saying for what seems like months now that we should have people over but we never seemed to get around to it. It seems that the best thing to do in this case is to just set a date and everything else usually falls into place. Sometimes its easy to fall into the trap of thinking that everything has to be perfect before we can have people over to our house. I know that I could work on adjusting this type of thinking personally. While its true that we want to make our friends feel comfortable we have to be balanced and remember that the encouraging association is the main reason for gathering together not the fancy meal or beautiful home. With this in mind we decided to chose a day and plan for guests. As is typical here since our public meeting and Watchtower study fall on a Sunday afternoon the friends like to get together after the meeting which usually ends up being around 3pm. We have been able to spend time with many of the friends in their homes while here in Spain and we are so happy to be able to try to show that same hospitable spirit to others by opening up our home. (3 John verse 8) This week proved to be an excellent opportunity since many have time off from work because of the Spring holidays. Kanicia has been excited to cook for the friends and throughout the week she has been contemplating what to make. Should she make Spanish food or American food? While it would be nice to show the friends some of the food that we are used to back home often times the ingredients for the Spanish meals are much more readily found. Kanicia ended up deciding to prepare a salad with beets, tomato, corn and a mild salsa. For the main course she served spaghetti pasta with meatballs and a tomato sauce. The meat here is much leaner and as a result the meatballs have a different taste than what we are accustomed to. 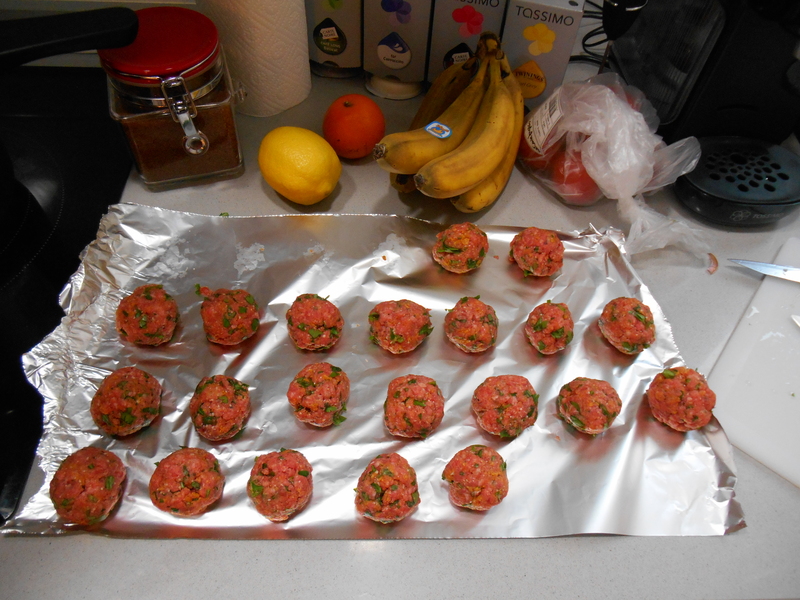 She mixed mint, thyme and some other spices into the meat balls and the end result was delicious. I was given the task of selecting the appetizers and drinks. I though it would be a good idea to have a plate of charcuterie and cheese along with several baguettes. This was served alongside some Spanish olives. As is the case here there is no shortage of selection when it comes to meat and cheese. We had an array of chorizo from Pamplona, smoked jamon and some other meats. As for the cheese we had brie, mezcla, and two other French cheeses. They were all a big a big hit and I think that I will chose this again in the future. For the drinks I had gotten a bottle of El Coto 2010 Crianza which is a Spanish wine from the Rioja region comprised of a mix of Merlot, Tempranillo and Cabernet Sauvignon. It’s a great combination and the wine was wonderful! I recommend trying it if is available in your area. In addition to that one of the brothers brought some Franziskaner Hefeweizen. For dessert one of the sisters had prepared a cake. Along with that we were able to make use of our new coffee machine to enjoy cappuccinos and coffees. The evening was very enjoyable and there was lots of lively conversation as is all so common here in Spain. We learned a lot about our new friends and we were able to share some things about where we are from as well. On nights like these we really can see the truthfulness of the words in Ecclesiastes where food and drink and rejoicing with friends are compared to a “gift from God.” (Eccl. 3:12, 13) How grateful we are to be able to associate with other faithful servants of Jehovah regardless of where we are on earth. Even though we may be far from family and old friends we find much comfort in our worldwide brotherhood and all of those that we can come to know and love as a result of it. As this old system marches ever closer to its conclusion with each passing day we realize that the bonds of Christian unity that we develop with our brothers and sisters will serve as a real strength as we traverse the great tribulation and the events that follow. We look forward to having more people over to our place and continuing to try to show hospitality and thanks for all the blessings that Jehovah has given us! Starting the new service year!